President Jair Bolsonaro, who invited Netanyahu as guest of honor to his inauguration, plans to visit Israel days before Israeli election. Brazilian President Jair Bolsonaro will visit Israel days before its April 9 general election, the Israeli foreign ministry told AFP on Thursday. Bolsonaro, a former paratrooper intent on forging close ties with the US and Israel, said before taking office that he planned to follow US President Donald Trump's lead in moving Brazil's embassy to Jerusalem. 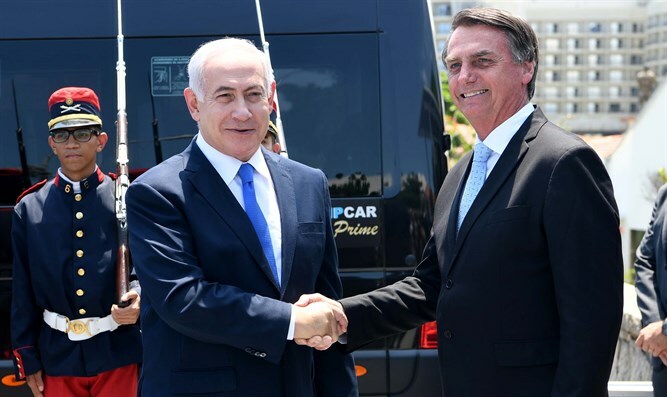 Israeli Prime Minister Binyamin Netanyahu attended Bolsonaro's January inauguration in Brazil. The foreign ministry spokesman said that Bolsonaro would visit from March 31 to April 4. "Netanyahu hopes Bolsonaro will move his embassy in Israel from Tel Aviv to Jerusalem," Israel's Haaretz daily wrote on Thursday. "In exchange, Israel is expected to offer information and procurement opportunities to assist Bolsonaro's flagship project, domestic security." Announcement of an embassy move or just recognition of Jerusalem as Israel's capital would be a welcome move for Netanyahu who is fighting for a fifth term in office.